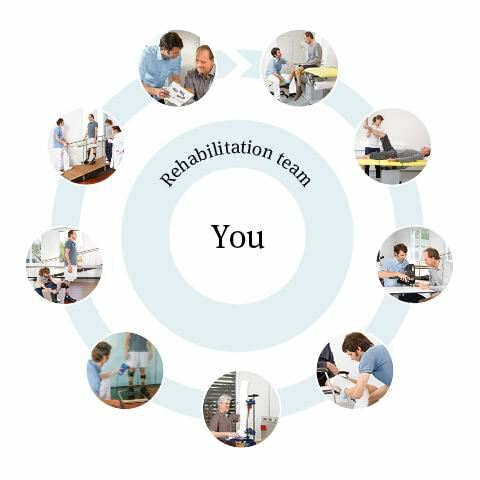 Our Treatment Circle shows you at a glance all the different steps involved in the fitting process for your orthotic device at the Ottobock Competence Centre. 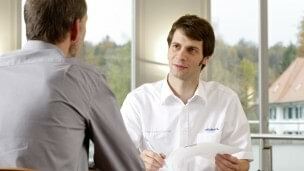 Here you find detailed information of what to expect of our services before, during and after your fitting. The ultimate goal in all our Competence Centres is to restore your mobility, which includes increasing your level of independence and maximising your quality of life. In order to achieve this you will be supported by your interdisciplinary rehabilitation team consisting of doctors, therapists, prosthetists/orthotists as well as your family and friends. The whole process can take a couple of months depending on various factors amongst others your own motivation and participation. During the inspection your orthotist at the Ottobock Competence Centre examines and observes your overall posture while standing (assuming you can stand or are fitted with an old orthosis). The focus during palpation is laid on prominent bone structures as well as other sensitive areas such as wound and scar tissue which your orthotist must keep in mind during the design of your orthosis. Lastly, a functionality test is conducted in order to examine your residual muscle function. There you will be asked to perform different movements with your affected leg – as far as possible – while your muscle function and strength is being observed. This forms then the basis which leg orthosis type is most appropriate for you. The decisive factor that influences the selection of a suitable fitting solution is your residual muscle function. Depending on this information and your personal needs and wishes you and your orthotist at the Ottobock Competence Centre establish which function your custom leg orthosis needs to fulfil. For us at Ottobock, regaining your mobility means that your orthosis fully supports you in each of your daily activities. Detailed measurements are important so that your orthosis fits you perfectly and you feel safe during each phase of the movement. The exact shaping of your orthosis is extremely important in this respect, just like a shoe: if it isn’t a good fit you can’t walk properly. This is why Ottobock is constantly developing novel tools and methods so as to accurately measure your body. In our Competence Centres we use both digital methods and plaster cast, depending on the condition of your leg to ensure precise measurements. Your orthotist at the Ottobock Competence Centre will first manufacture a test version of your custom leg orthosis to guarantee a perfect fit of your final solution. You can use the test orthosis for gait training with the therapist. Together with your orthotist you will answer essential questions according to the fitting: Does the orthosis correct your posture? Does it offer the functions need? Does it fit you well? You may need to visit the Ottobock Competence Centre several times to ensure that the fit of your new orthosis is correct. Please be patient at this stage of the process – it pays off well in the end. After the successful fitting, adjustment period and rehabilitation, you'll be ready to master the challenges of daily life in social and professional settings. A multidisciplinary team composed of our therapist, orthotist and, ideally, your own doctor will make the final approval of your custom leg orthosis. By now you'll have already gained some initial experience with your new orthosis and decided whether it meets your needs and expectations. Finally, our special Dartfish video software analyses your gait pattern and shows the progress you made during your treatment at the Ottobock Competence Centre. Before you leave the Ottobock Competence Centre, your orthotist will present you with a treatment outcome report for your documentation and a manual containing all the important information you need concerning the use of your leg orthosis.